4.30pm: Pilgrim Statue arrives at the Cathedral of St Mary and St Anne. Consecration of all individuals to the Immaculate Heart of Mary followed by Rosary. 5.30pm: Mass followed by Enrolment in the Brown Scapular. 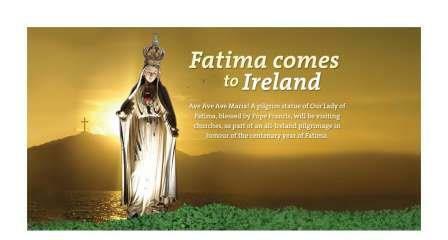 9.00am: Pilgrim Statue arrives at the Church of the Immaculate Conception, Clonakilty. Consecration of all individuals to the Immaculate Heart of Mary followed by Rosary. 10.00am: Mass followed by Enrolment in the Brown Scapular.